Cloudy skies. Areas of patchy fog developing. Low 68F. Winds ESE at 10 to 15 mph..
Cloudy skies. Areas of patchy fog developing. Low 68F. Winds ESE at 10 to 15 mph. The Galveston Rugby Football Club's Almar Lubbe, JP Coomer and Brandon Gratiot celebrate after Lubbe scores a try in a game against the Woodlands Rugby Football Club Saturday, March 9, 2019. 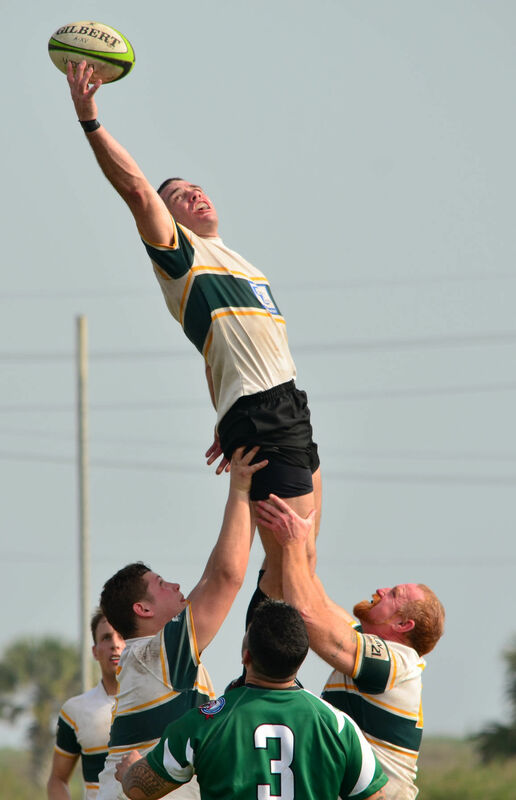 Galveston Rugby Football Club’s Almar Lubbe and Tony Pryor lift Bryan Daenan during a lineout in a match against the Woodlands Rugby Football Club Saturday, March 9, 2019. Galveston won the match 76 to 5. Galveston Rugby Football Club’s Austin Kirwin runs with the ball followed by his teammates, from left, Ezra Alpuche, Brandon Gratiot, Bryan Daenen and Corbin Hoffmann during a match against the Woodlands Rugby Football Club Saturday, March 9, 2019. Galveston Rugby Football Club's Bryan Daenen runs with the ball during a match on Saturday, March 9, 2019. Galveston Rugby Football Club's Corbin Hoffmann runs past the Woodlands club's defense to score a try during a match on Saturday, March 9, 2019. Galveston Rugby Football Club's Coach Ramiro Silva talks to the team at the half during a match on Saturday, March 9, 2019. Galveston Island’s spring fog broke just in time for the Galveston Rugby Football Club’s match against The Woodlands Rugby Football Club on Saturday. Proving equally aggressive and defensive, the Galveston Rugby Football Club let almost nothing past them, winning the match 76 to 5. The club’s last match of the season will be March 23 against the Houston United Rugby Team.